I am going to start this posting with a major confession. Somehow I made it through the 80s (and the 90s) without recalling having heard The Damned. In the catholic religion, I think what I just confessed would be considered a mortal sin as opposed to a venial sin which is forgivable. I do recall hearing The Damned mentioned by several people and publications but I don't recall ever having actually heard the band. I think what probably happened is I figured I would hear a song of theirs sooner or later but never did. So, when I saw The Damned were at Irving Plaza, a place I haven't been since the 80's, I thought it was time to serve my penance. Ironically, when I wrote the contact email on The Damned website expecting to hear from their publicist, I heard back from their drummer Pinch. He kindly put me on the press list and luckily gave me a photo pass which turned out to be a Godsend. I will clarify the reason why later in this posting. Wikipedia says "The Legendary Shack Shakers are an American punk blues band inspired by punk, Delta blues, rockabilly, Texas polka, gothic rock and other traditional Southern music genres." I'm going the easy route by just calling them a country punk band. With bass player Mark Roberston playing stand up bass and singer J.D Wilkes holding a Shure 55 Vintage Unidyne microphone the band definitely had that rockabilly Elvis look. Their set was energetic, to say the least, but beyond that their music incorporated the best of all the genres I previously mentioned. Lead singer Wilkes is a modern day Iggy Pop who is ultimately not comfortable until his shirt is unbuttoned and ready to be taken off. He eventually stuck his hand in his pants several times with the threat of revealing his 3 piece set to the audience but that never did. At one point, Wilkes walked into the audience and rubbed a guy's bald head before getting back on stage. But despite Wilkes wild man theatrics, he was an excellent singer and harmonica player. And though guitarist Duane Denison seemed a little sedate next to Wilkes, Denison played a vibrant rhythm as well as lead guitar. 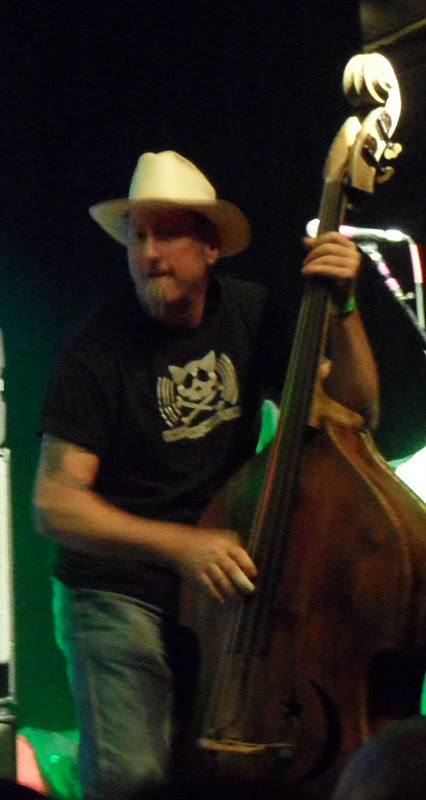 I don't have a set list for The Legendary Shack Shakers because I wasn't familiar with the band until the day of the show and the though I did email their label and tour management for info., they weren't responsive. I do think I remember the band doing "God Fearing People" and "Greasy Creek" from their most current CD Agridustrial. But whether or not I knew The Legendary Shack Shakers' songs on the day of the show, their set has got me listening to it since. The Damned were slated to do two of their albums from start to finished. The first being their debut recording Damned, Damned, Damned and the second being The Black Album, which was basically a shift in musical direction from their punk roots and a change in their lineup. The reason for doing such a concert was in celebration of their thirty-fifth Anniversary. When The Damned walked on stage,Captain Sensible aka Raymond Burns told the audience we were going back to 1977, when everyone was depressed and no one had a job. When the band broke into the opening bassline for "Neat, Neat, Neat" the crowd cheered and off the we went. The band rocked the house and the audience pushed up against the stage, swaying and pushing from side to side. Up until that point I was pretty comfortable, but from that point on I knew I wasn't going to last long. I would have been fine, joining in with the crowd, 35 years ago but not in 2011. Daddy (me) has a bad back. I could definitely see why people liked The Damned from back in the day and still liked them now. So,I wanted to stay where I was for as long as I could take the abuse because I was determined to watch the band up close, even as the person next to me screamed "I'm a Fan Club," in my ear during the song. In the meantime, I was finding the whole evening funny. There were a lots of young people dressed in black and lots of middle aged people wearing leather. On stage, all the members of the band except Dave Vanian were wearing sunglasses; Vanian choose to make his fashion statement with sunglasses after the intermission. When the band got to "I Fall" the audience really began swaying and all I could think "yup - I will be falling shortly." During the song,Monty Oxy Moron AKA Montgomery Gillan didn't play much on his keyboards but did background vocals while making sort of zany motions with his arms and hands. During "Born To Kill" Moron jumped up and down looking like an overweight Richard Simmons doing an aerobics workout. I pretty much spent the time during the second half of the first album trying to get to photo area. The problem? Three woman who decided they were going to be spiteful because they could and if there were ever three woman who could make this gay man into a misogynist, these three woman definitely came close. I was trying to make my way through to the photo area but they blocked passage and would not let me through. I explained that I was not trying to get over on them in any way, shape or form. I was even polite and used the word "please" several times. Unfortunately, politeness didn't work. But to make matters worse, the three woman spoke about me several times agreeing they were not going to let me through. (You know the kind of chatting mothers do when they act like their kids are not in the room.) The ring leader even told her husband to tell me I wasn't passing through. I took a deep breath and told myself to stay calm. Then I waited for the intermission. When the area around them loosened up, I made my way to the photo area with my Irving Plaza Photo pass applied to my jacket. Perhaps I could have handled the situation differently, I'm not sure. But I did find the disparaging treatment I received from the three middle-aged woman, and a man in toe, extremely disappointing. In other words, they didn't make me too proud of my generation. For the second set The Damned did The Black Album. When The Damned walked out everyone including Vanian were wearing sunglasses. However, Sensible had changed from his new wave retired veteran's outfit to a quasi Little Lord Fauntleroy outfit that had a scull and bones printed on the back. He was definitely a site. The Damned played "Wait for the Blackout" with a fiendish fever and went directly into "Lively Arts" as a one two punch. After momentary pause, Sensible continued by singing "Silly Kids Games" by himself. Vanian figuratively took a back seat by standing downstage right to the side of Pinch's drum kit. The die hard fans sang along with the song but from my perspective the energy in the room went down a bit. But after Moron finished playing the outro with a piano keyboard sound from way back when, and West started playing "Drinking About My Baby," the energy on stage and in the room went back up. Saturday night was the first time hearing "Twisted Nerve," but I listened to it couple of times since the show and I can honestly say that the song is better in concept than execution. Cool idea but....I'll leave it at that and state that I probably would have loved it in 1980 whatever. "Hit and Miss" was the point when I got to see security grab body surfers as they floated into the photographers area in front of stage. The surfing pretty much continued from that point on through to the end of the show including the encore. One guy, with a large blond sprayed or jelled Mohawk, road the audience wave to the photographers area twice. The good news, at least for security, was that three quarters of the audience was too old to body surf. The Damned did several more songs culminating with "Curtain Call" which wasn't so much a high point - it was more like the fat lady singing - it meant the show was almost over. Moron and Sensible did a lot of keyboard work in the middle of the song that seemed to go on forever besides seeming reminiscent of doing lots of drugs in 1980. The Damned ended by coming back for three encore songs but all they had to really do was one because the audience kept hollowing for "Smash It Up." The Damned eventually complied by making it their last song of the evening. Did I love The Damned? Not really - but I didn't hate them either because I was able to see that, once upon a time, they were a really happening band. They're still happening to enough people to sell out Irving Plaza and in the end that's all that matters.